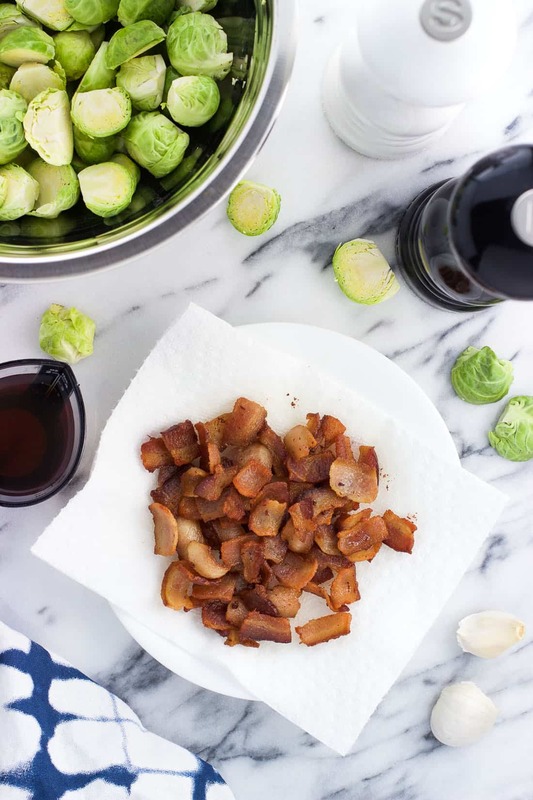 Maple bacon roasted brussels sprouts are made all in one pan for a delicious side dish that cuts down on dishes. 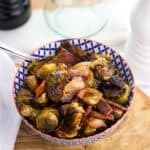 This roasted brussels sprouts recipe with bacon features easy kitchen staples and pairs well with chicken, pork, and more! 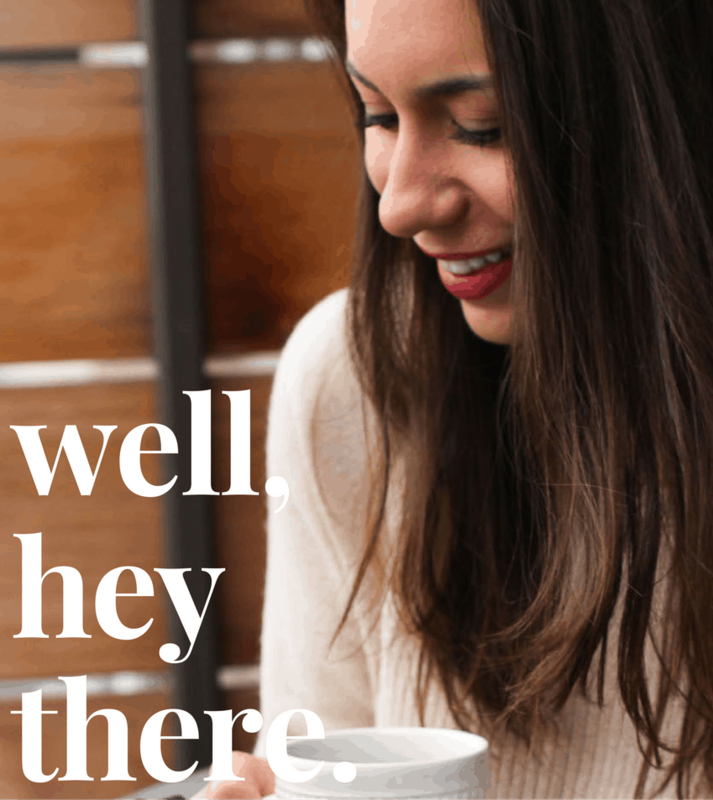 As a semi-professional grocery shopper, I’ve discovered that I have a few peculiar quirks that manifest themselves when I’m at the grocery store. For starters, I really hate “breaking” apart produce like a bunch of bananas, a knob of ginger root, etc. No clue why. I’ll usually end up buying more than I planned for to avoid the whole ripping them apart thing. More to experiment with (and thankfully they’re both cheap!). I’ve also sharply honed my avocado-picking skills and can successfully open a plastic produce bag and grab out a head of lettuce in the seconds between the thunder sound and the produce mist beginning. The last one deals with brussels sprouts, in that I can bag up an estimate of one pound of brussels just about on the nose. Since this has been a newish realization, I’ve tested it out on about every recent trip with crazy consistency. 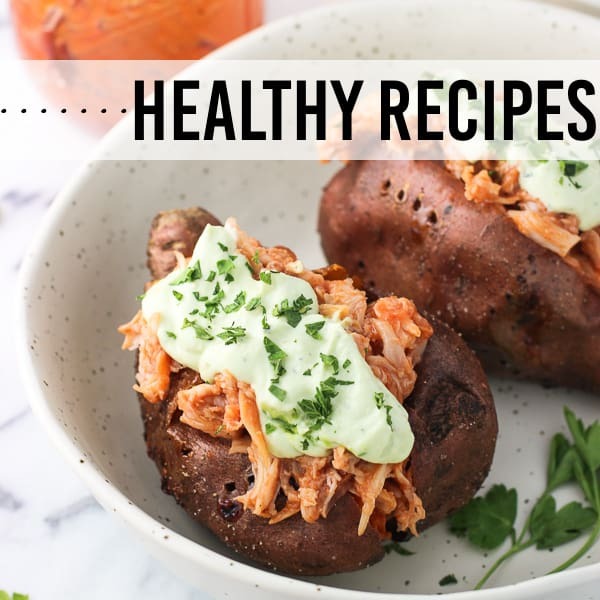 Obviously a side effect of this has been lots of roasted brussels sprouts side dishes. I got to experimenting with a little of this and a little of that, and landed on these one pan (!) maple bacon roasted brussels sprouts. One bite and it was quickly determined these will be on repeat! A must when it comes to brussels sprouts for me is that they’ll be very roasty. Deep dark brown with the outer leaves crisp. Boiling them? No thanks. 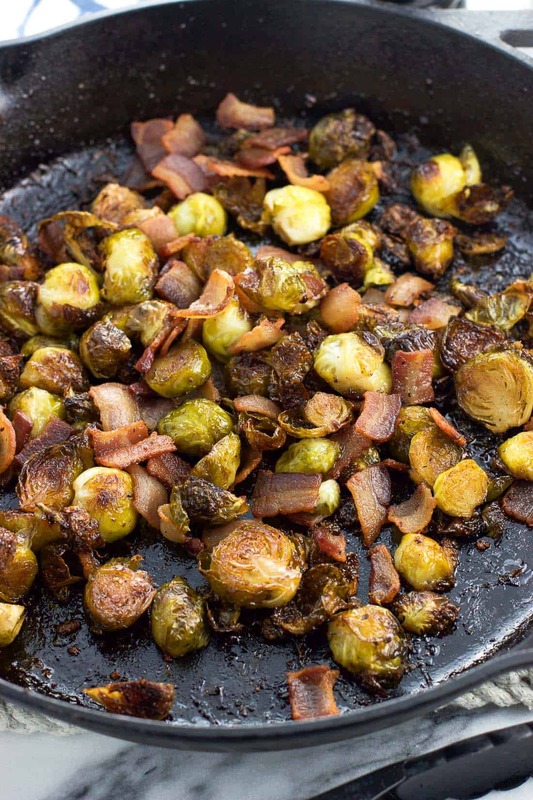 This brussels sprouts with bacon recipe roasts in a cast iron pan for an amazing caramelized texture and flavor. I usually lean towards Asian-inspired flavors when it comes to brussels (like these crispy brussels sprouts with sesame glaze and honey sesame roasted brussels sprouts), but raided my fridge and pantry for these in an effort to use up remaining little bits of ingredients. 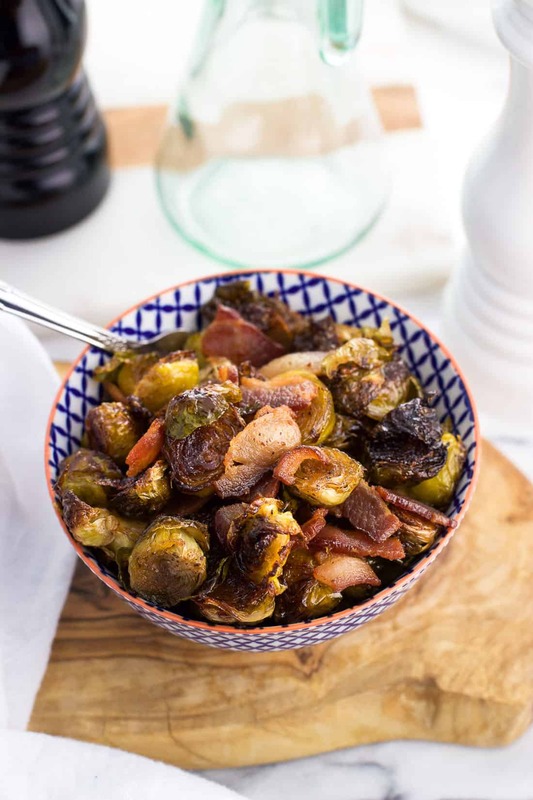 Maple syrup, apple cider vinegar, garlic, salt, and pepper are always around, and combine with four strips of bacon for a slightly-sweet-but-decidedly-savory bacon roasted brussels sprouts side dish that we scarfed down before we even dug into our main course. The first step is to cook the bacon. 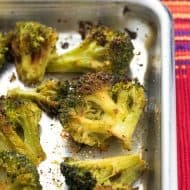 When I roast brussels sprouts I typically reach for a rimmed sheet pan to do the job, but since I needed to cook the bacon as well, did I really want to wash more dishes? The answer to that question is an emphatic NO. So, I got out a large (12″-diameter) cast iron pan that I used as both the vessel to cook the bacon on the stovetop and to roast everything in the oven. Works like a charm! 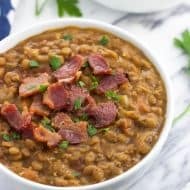 Once the chopped bacon is cooked, place it on a paper towel-lined plate to drain and sit for a sec as the rest of the dish is prepared. 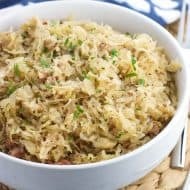 In the spirit of efficiency, I kept the bacon fat in the pan and used it in place of the oil I’d usually add to a roasted brussels sprouts recipe. 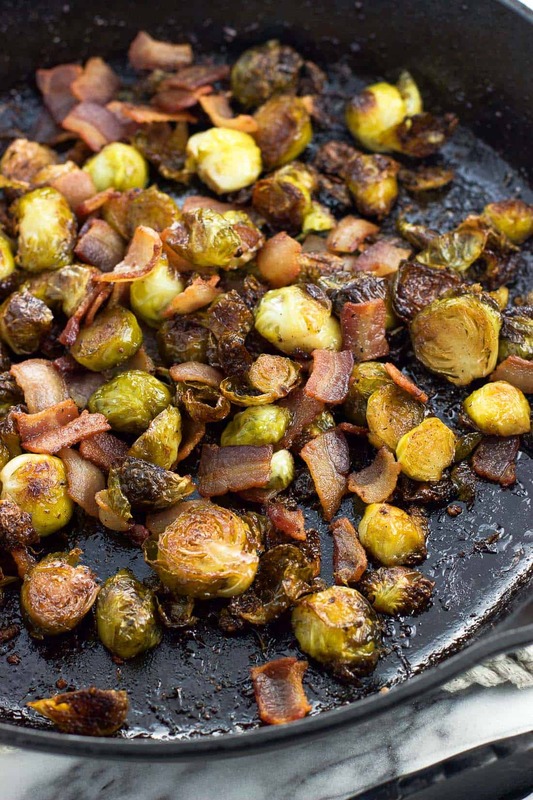 Forget just being efficient – the smoky bacon flavor that permeates the brussels is something special. Efficient and delicious. Into the pan go the brussels sprouts and minced garlic, with a sprinkle of salt and pepper over top. 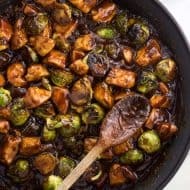 There’s also no need to mix up a glaze in a separate bowl or anything – just pour the maple syrup and apple cider vinegar into the pan and stir everything up until the brussels sprouts are evenly coated. You’ll want to use a large pan here so the brussels sprouts are in a single layer with some space between them. 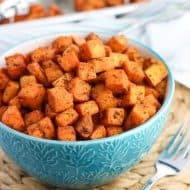 Crowding vegetables you intend to roast into a small pan can more so ‘steam’ them than help them get nice and toasty. Space is your friend. Now it’s time to roast. These bacon roasted brussels sprouts should be perfectly toasty and caramelized within 35-40 minutes, but do keep an eye on them and keep them going as long as you like. Flipping the sprouts every 10 minutes or so will help all sides of them get a chance to lay flat along the hot pan and toast up nice and good. Once roasted, add back the bacon (you can heat it up quickly in the microwave, or just toss it into the hot pan with the brussels sprouts to heat back up) and it’s ready to serve. 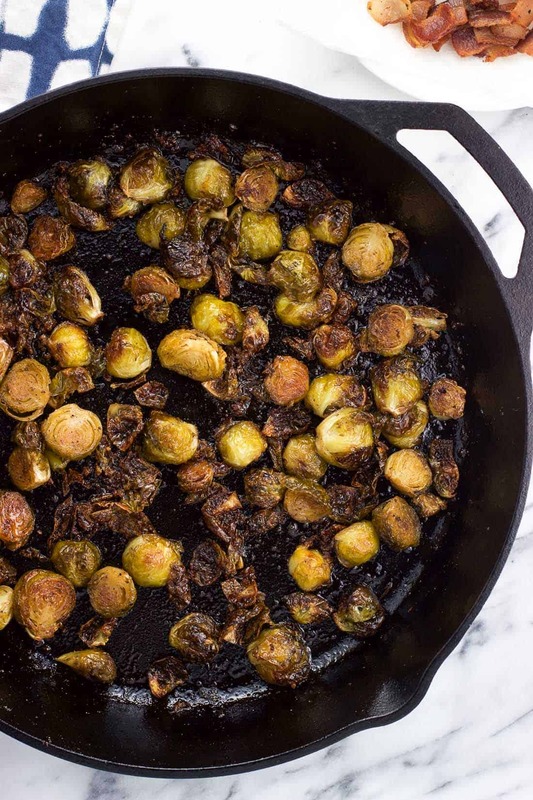 A large cast-iron pan helps keep this roasted brussels sprouts recipe to one pan. This set of two hot handle mitts is a lifesaver. I don’t trust myself to remember not to grab the hot cast iron pan handle once I’m in the zone of throwing together a recipe, so covering the handle with secure-fitting mitts while the pan is on the stovetop or immediately after it comes out of the oven ensures your hands won’t get burned. These cast iron pan scrapers make clean up so much easier! All those burnt bits stuck to the bottom of the pan come up nicely after a short hot water soak without worrying that you’ll scratch the pan. 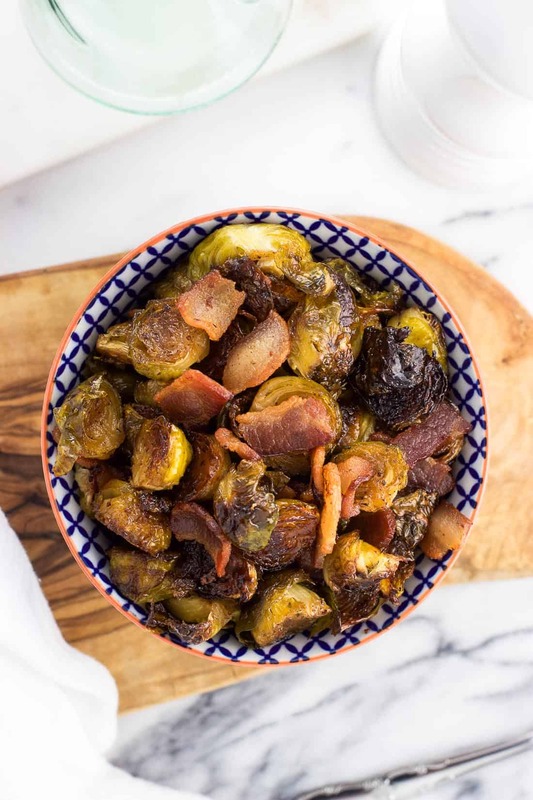 Maple bacon roasted brussels sprouts are made all in one pan for a delicious side dish that cuts down on dishes. This roasted brussels sprouts recipe features easy kitchen staples and pairs well with chicken, pork, and more! Preheat oven to 400°F. Rinse brussels sprouts and remove any yellowish outer leaves. Cut off the bottom stems and slice each one in half vertically. Set aside for now. 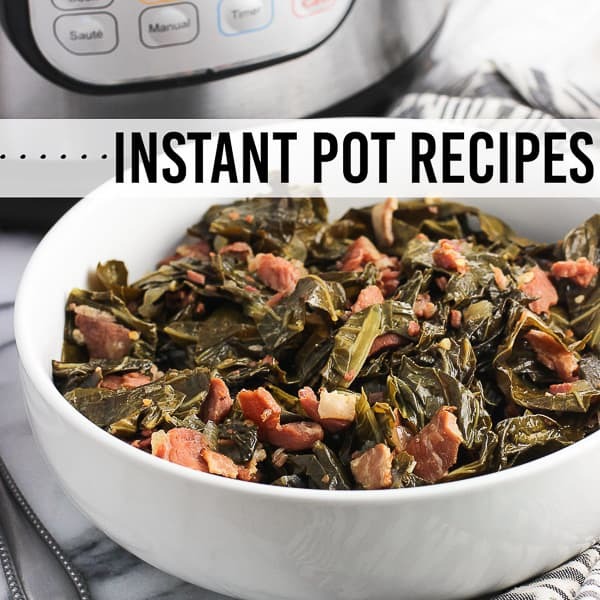 Chop bacon and add to a large cast iron pan set over low-medium heat on the stovetop. Cook, stirring occasionally, until the bacon crumbles are fully cooked (about 8-10 minutes). Remove cooked bacon to a paper-towel lined plate and remove the cast iron pan from the heat. Add brussels sprouts and minced garlic to the pan with the bacon fat. Season with salt and pepper. 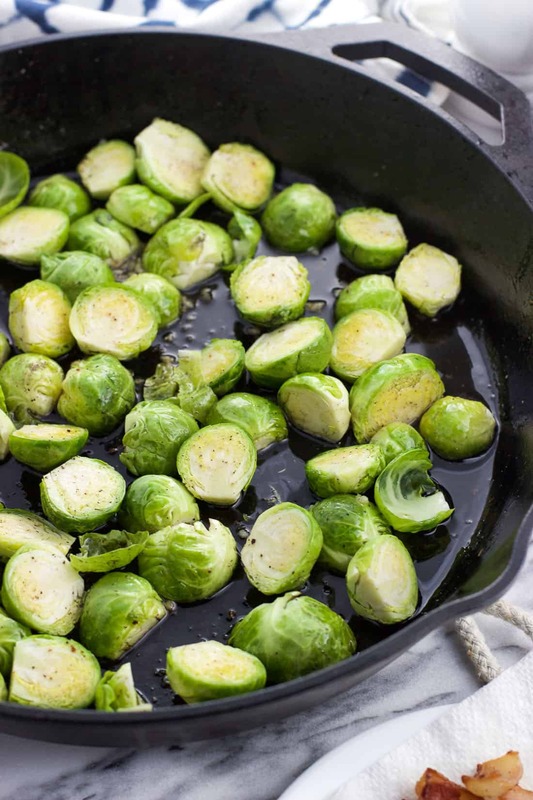 Pour in maple syrup and apple cider vinegar, then toss so that the brussels sprouts are evenly coated. Transfer the pan to the preheated oven. Roast for 35-45 minutes, removing the pan to flip the brussels sprouts every 10 minutes or so. Roasted brussels sprouts are done when they're well browned and the edges are crisp. 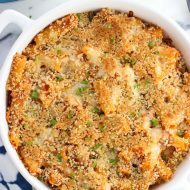 Once removed from the oven, add back cooked bacon crumbles and toss to combine. Serve immediately. Be careful not to grab the hot handle of the cast iron pan with your bare hands. It can be a hard habit to break, so see the notes above about the hot handle mitts I use when I cook with cast iron. 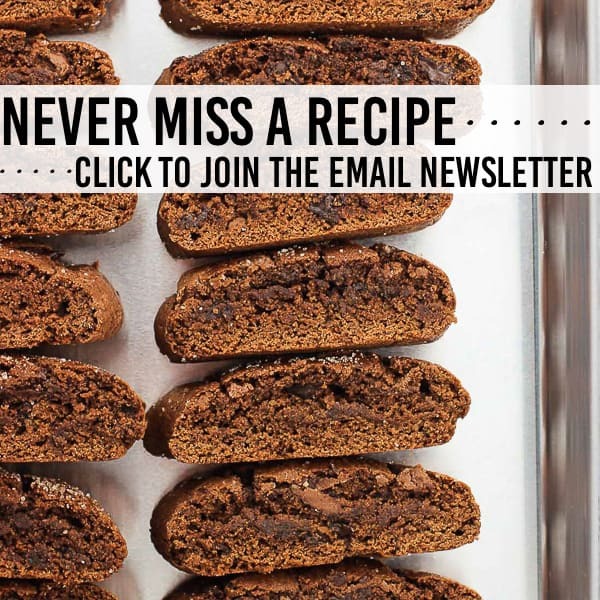 This recipe couldn’t have been any better. I never imagined my whole family would be fighting over Brussels sprouts! Delicious. This is probably the best way ever to eat brussel sprouts!